Thousands of people in Pakistan have attended funerals in the city of Karachi, a day after a suicide bomb that claimed the lives of 43 people. Firefighters are still extinguishing flames following rioting after the attack on a Shia Muslim march. Government offices remained closed and security was tight before and after the funerals. Dozens of people were injured in the bomb, which struck as Shias marked the climax of the holy month of Muharram. No-one has claimed responsibility for Monday's bomb. But Sunni extremist groups linked to the Taliban and al-Qaeda are the obvious suspects, says the BBC's M Ilyas Khan in Islamabad. Minority Shias in Pakistan have often been targeted by Sunni extremist groups who regard them as heretical. 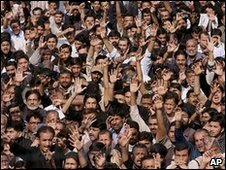 The main political parties in Sindh called for a business and transport strike in protest against the violence. On Tuesday morning, most petrol stations were closed in Karachi and there was little traffic on the roads. Karachi fire chief Ehteshamul Haq told the AP news agency that two buildings with dozens of shops and offices have already collapsed and two more were in danger of falling. Saleem Khan, owner of a car rental business, told Reuters news agency: "Our office and the whole building is completely burnt. Everything has been destroyed." 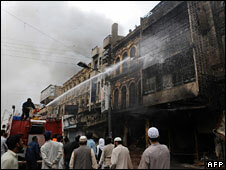 Officials said the violence was possibly triggered in an attempt to heighten sectarian tensions. "We believe that it was a planned conspiracy," said Interior Minister Rehman Malik. "Those who went violent were miscreants and not the protesters." There have been numerous attacks on such processions across the country over the last few days. On Sunday, eight people were killed when a suicide bomber targeted a Shia march in Pakistani-administered Kashmir. Meanwhile, hundreds of civilians have died in bomb attacks in recent months as Pakistan's army concludes an offensive against Taliban militants in South Waziristan and surrounding areas.